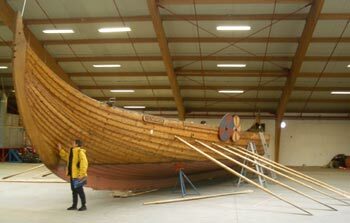 This Icelandic-made replica of a Viking ship sailed to NY in 2000. Iceland is, well, different from the rest of Europe. And one of its differences is being absolutely devoid of any prehistory. We've sought out sites in Hungary and France where 500,000 year old bones of early humans were found. We've admired the decorated caves and ivory Venuses from 10,000 to 25,000 years ago in France and Spain and we've walked the ruins of Hittite and Roman cities that are now 2,000 to 3,500 years old. But though a Greek explorer and some Irish monks may have sailed by Iceland, the first known people to spend any time on the land were Vikings in the late 800's. It was surrounded by too much ocean and was often too cold to be a draw even for the hardiest of our early predecessors. The newness of it all was highlighted during a visit to what is billed as one of the best historical museums in Iceland, as display cases were weighted heavily towards the tennis shoes and gear of Iceland's Olympic athletes, a dental office that looked like it was from the 1950's and a pair of high heeled shoes from 1983. They also had some relics from the 1800's, but the remnants of their brief, earlier history are scant. And it's not just Iceland's human history that is new, its expanses of land are some of the youngest on the planet. The island itself was only formed about 20 million years ago and the oldest rocks are 17 to18 million years old, appearing long after the dinosaurs vanished from the Earth. Iceland is one of the most volcanically active areas in the world, so the ground on which we walked is hundreds of millions of years newer than in most countries we've visited. It's so fresh that when they recently dug a tunnel under the sea to link the tips of 2 fjords, they discovered that the 2.7 million year old lava was still sizzling at about 170 degrees F.
And whereas the history of Europe seems to us to be defined by periodic wars, often every 20 years; the history of Iceland has been defined by volcanic eruptions, and sometimes subsequent floods, on an average of every 5 years. Like the wars of continental Europe, Iceland's natural disasters often resulted in immediate, massive losses of human and livestock lives and ongoing losses from the resulting famines. Iceland was literally a late-bloomer: according to one person bees only arrived on the island in the last 100 years or so. Unlike much of Europe, Iceland was not devastated during WWII. It was occupied by the Brits and then the Americans after the Nazi's invaded its overlord, Denmark. Instead, WWII was a huge boost to Iceland. The invasion of Denmark made it easy for Iceland to finally free itself from Denmark's control; the British and then American militaries employed many Icelander's for construction projects during the war and, amazingly; after the war Iceland received aid under the US's Marshall Plan. Bill presumes that the aid was essentially a bribe for continued use of Icelandic airbases by the US during the Cold War era--it's hard to imagine they needed the aid as WWII had been a net gain for Iceland. WWII catapulted Iceland into the modern world and gave the economy a boost like it had never before experienced. But even so, the people of this tiny country of only 290,000 have lived at a different pace. In parts of the southeast, mail was only delivered 4 times a year for centuries and in the middle of 20th century it was up to twice a month. As late as 1988 Iceland only had one TV station, which was state owned and shut-down on Thursdays. Even in 2004 we only saw 3 TV stations, one of which runs un-dubbed American sitcoms and movies. We only located 3 radio stations on our car radio (none in English) and the foreign newspapers were at least 3 days old when they hit the news stands. However, Iceland now has the highest penetration of mobile phones of any country. But the history lesson we came to Iceland for was its natural history, not its socio-political past--we were drawn by its reputation for fire and ice. We'd already had the privilege of watching Mt St Helens explode from our door step, scrambled around on fresh lava in Hawaii, and explored the foot of a huge glacier in Alps, so it wasn't a first look at these wonders that intrigued us. We were instead savoring the rare glimpse of the geological activity that occurs almost exclusively on the ocean bottom that here is actively occurring on land. Iceland doesn't sit on a continental plate like almost all the Earth's other land masses but instead sits squarely on the Mid-Atlantic Ridge between 2 plates: the American and European continental plates. The Mid-Atlantic Ridge is a 10,000 mile long, loosely stitched seam in the Earths' surface--loose and thin enough that along its mid-line the Earth's magma periodically leaks out. The magma wells up through the gap created by the movement of the continental plates away from each other. And each time that magma makes its way through the crust and onto the ocean's bottom, it makes the Atlantic Ocean a little broader. It's this broadening process in the Atlantic that necessitates a complementary shrinking of the Pacific Ocean, which in turn triggers the catastrophic earthquakes along the west coast of the US and in Japan. Iceland exists as an island because it is both situated on the Ridge and on a volcanic hot spot. Hot spots spew lava from deep magma chambers over thousands of years. There are 20-30 hot spots around the globe and the Hawaiian Islands are formed by a hot spot but one that isn't also on a Ridge. Iceland's hot spot is so hot that it has received about one third of the world's lave flow in the last 400 years. We didn't expect to see molten lava in Iceland, but we did come to walk on the Ridge itself. Bill caught the bubble that forms as the geyser erupts. We picked-up our rental car after 3 nights in Reykjavik in southwestern Iceland to begin our clockwise tour around the island. 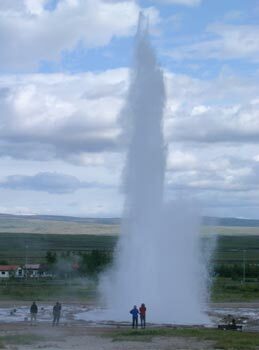 But never good about traveling in direct lines, we began with a slight detour to the east to see the Big 3 or Golden Circle: a geyser, a waterfall and part of the Mid-Atlantic Ridge. The Gullfoss waterfall was big and beautiful and we saw both this stunning active geyser and the snoozing old timer which gave its name "Geysir" to all other spouting hot springs. For us of course, Thingvellir, which is a vast area where the American and European continents are pulling apart, was the highlight of the Golden Circle trio. The most remarkable sights were the long vertical walls of lava with parallel fissures--fissures caused by the lava being torn apart as the 2 continental plates move away from each other. I thought the gap in the Mid-Atlantic Ridge was dozens or hundreds of feet wide, but its probably dozens of miles wide. Amazingly, we heard several different stories, sometimes at the same location, as to the width of the Ridge. Between the elusive, widely separated lava edges of the 2 continents is an obvious sunken, though ordinary looking, lava field. There isn't anything that shouted Mid-Atlantic Ridge (or made a convincing photo) but it was satisfying to see both what it was and what it wasn't. And it was exciting to walk across lava that is part of a phenomena that should have been deep on the ocean floor. 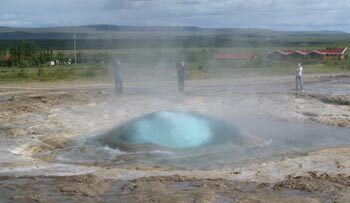 But like a quiet spell between volcanic eruptions, life was a little too dull after we left the Golden Circle. We were on Day 8 of our 17 day tour of Iceland and were frankly getting bored. The long hours sitting in the car, the persistent clouds and cool weather, the high prices and marginal lodging were wearing us down and the sightseeing wasn't making up for any of it. We now clearly understood the Icelandic joke: "If you're lost an Icelandic forest, just stand up," though the joke still worked for us without "in a forest." 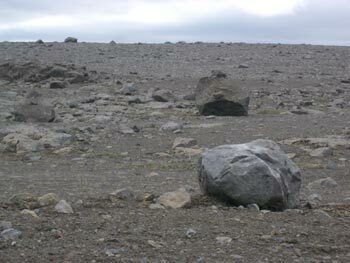 Western Iceland is visually barren. The books are quick to counter that its not technically barren because there are over 450 varieties of lichens and mosses applying a veneer to the rocks. And grasses do grow well in the coastal areas, creating a fuzzy green covering over most of the low lying land and part way up the mountain slopes. But the fjords and inland valleys are all glacier carved, creating a quickly familiar massive, scooped-out look everywhere you look. And the next valley looks a lot like the last. It is hard to get lost, as you are either traveling one direction or the other in the valley and aren't likely to be going over the top of a towering mountain. The scale is so large, you can see so far and there is so little of anything on the green background fuzz that it gets monotonous. I can usually find a lot to spark my curiosity, but I was failing the challenge to be fascinated in western Iceland. One of the many glacier-carved valleys in western Iceland. While driving, we eagerly looked for the small groups of free-range sheep as they were the most reliable distraction from the visual drone of the landscape. They were often close to the road, or in the road, and the many white lambs were charming. The short-legged Norse horses with their heavy manes came next on the list of things to notice, then the few other cars on the road, followed by a rare homestead. Trees didn't disturb the naked look of the fjords as deforestation of the few low-growing birch trees occurred shortly after the Vikings settled on Iceland and reforestation is an emerging concept here. The ocean or a river came into view several times a day, but like on the land, there wasn't much going-on in or around the water. Boats were rarely seen and the fresh and salt water boundaries lacked any distinctive foliage or human activity. Iceland has a vastness that is rare in Europe but reminiscent of that found in the plains and deserts of the US. We found ourselves frequently rereading the guide book in hopes of understanding where we missed that stretch of spectacular scenery it had promised. Laughingly we decided the only possible explanation for the discrepancy between our experience and the guide book's descriptions was that the authors must have been high on drugs as every day's drive should have been sprinkled with things that provoked "spectacular," "dramatic," "most beautiful in Iceland," or "shouldn't be missed" from them. And we were perplexed by their eagerness to spend a full week exploring some of these unengaging areas. Yes, there was a nice waterfall here and there and we took some pleasant walks, but we could easily get more scenery for less money at home. As we rolled over 1,000 miles on our odometer, Bill noted that we would have seen more variety in the landscape in the same distance in the US, even if we were traversing the unexciting Great Plains. The word "complexity" had bubbled up as one of the things we were missing in our visual experience of Iceland as there just wasn't much to command our attention. Given that, we could hardly contain our laughter when a tourist info person recommended an area because it was "quiet and simple". The area in question was one of his favorite areas and it is flat and desert-like. For us, getting out of the cities usually brings enough 'quiet and simple' into our lives and most any given day's scenery in Iceland left us longing for more stimulation, not less. Being in Reykjavik gave us doubts that we could ever live in Iceland and visiting western Iceland removed any lingering ambiguity. Hardened lava crumbled by the rising & falling of the land. Our hunger for eye candy was instantly satisfied when we arrived in the Lake Mývatn area in northern Iceland. We had hoped it would be special, but the over used words like "incomparable" and "exceptional" had tempered our expectations. Lake Mývatn is in a particularly volcanically active area, even by Icelandic standards. 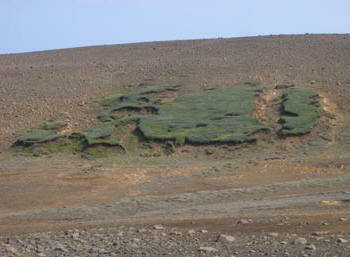 The last eruptions, the Krafla Fires, occurred from 1975 to 1984 and the area is still smoldering and sputtering. Geologists are guessing that the next 'big one' should be 250 to 1,000 years away. But spurred by the fact that the 2 mile deep magma chamber is filling again, the Icelanders are hoping for a spectacle long before the geologist's predictions. The broken ceiling of a long, tall lava tube in southern Iceland. Occasionally we saw crumpled, several foot-thick layers of hardened lava, like a bulldozer only had been partially successful in piling up a broken asphalt road. We believe that this amazing looking lava bed demolition work occurs because of the extreme rising and falling action of the land here. The great magma chamber periodically fills with molten lava, causing the surrounding land to rise and presumably cracks the old, hardened lava. The magma eventually bursts out as a volcanic eruption or oozes into fissures that may or may not break the surface. However the release occurs, when the magma chamber is emptied, the earth quickly subsides or sinks down, again cracking and deforming the old cold lava as well as the cooling lava. This process repeats its several every few months for several years, then settles down again for hundreds of years. It wasn't hard to imagine the creaking, groaning and snapping sounds that must occur when the cold lava breaks-up during the rising and falling of the land. Some of the anatomy of lava fields becomes exposed during the lifting and subsiding and we saw the ruins of dozens of lava tubes. Lava tubes form as molten lava cools just enough from the outside to provide a conduit for still-flowing lava to pour through. When the conditions are right at the end of a cycle of flow, the tubes drain out, leaving these pipe-like structures that can be up to 2 miles long and several stories high. Still sizzling at the Mt Leirhnjukur lava fields. It was almost like being here during an eruptive event to see the long row of steam vents traversing one of the immense lava fields of Mt Leirhnjukur near Krafla in the Lake area. We had walked along parts of it, being close enough to feel the warm steam dampening our socks and fogging up our eye glasses. It looked enough like the postcard showing glowing red lava spewing out of the same or similar fault to vividly imagine the more spectacular event that created the massive lava field. 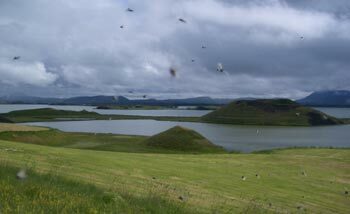 Pseudo-craters and midges at Lake Mývatn. On a day trip from Lake Mývatn we encountered the powerful work of yet another unfamiliar volcanic phenomena, a jökulhlaup. I haven't a clue how its pronounced but it means: "the flood caused by a volcanic eruption occurring under an icecap." This volcanic event must be primarily limited to Iceland as no one seems to have bothered to come up with an English equivalent. 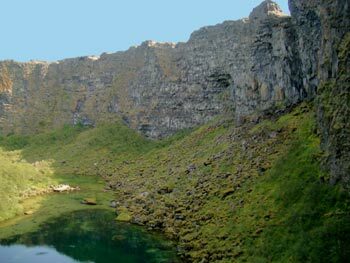 The Ásbyrgi Canyon shown below was carved out of volcanic basalt in 3 days or less by a jökulhlaup. 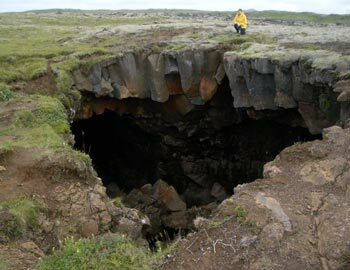 The canyon formed when a nearby volcanic eruption occurred under a glacier but didn't break through the icy crust. The huge amounts of ice melted from the trapped volcanic heat finally laterally broke out of its icy confines and the water was suddenly released. The water spilled over a plain of hardened lava from previous eruptions and presumably found some weak spot were it began eroding the lava rather than rushing over it. The weakness quickly became a waterfall, diverting increasing amounts of water down its face until this canyon of over 300' was formed in a few days. Jökulhlaups are a common occurrence in Iceland and a more recent one wiped out 3 critical bridges on the Ring Road in 1996 breaking the "ring" in the route. Ásbyrgi Canyon carved by a jökulhlaup in 3 days. We also saw a related geological process, which are top-hat shaped volcanic mountains called palagonite or tuff mountains. They get their distinctive flat tops and steep sides as a volcano erupts under a glacier, perhaps a glacier a half mile thick. If the volcano doesn't break through the ice, then the entire mountain forms from the piling up of fine, gritty tuff (similar to ash). If the volcano does eventually burst out of the ice lid, then the tuff mountain would be crowned with rough lava. The tuff eventually consolidates, making a firm stone. Just as when tuff mountains are formed, the stuff spewed out of volcanoes can take many different forms, even if it is all chemically the same. Amazingly, feather-weight pumice and glassy, heavy obsidian are made from the same lava; it's just that they cooled at different rates. Along with the Mid-Atlantic Ridge, these were the exciting phenomena we came to Iceland to see and we were finally forgiving the long, dull journey through western Iceland to get here. In the north we were in the land of hundreds of geysers and geothermal springs; craters and calderas; burping, concrete-gray mud pots; and the stench of sulfur hot springs. We picked our way across sharp lava fields; slogged in the rain-produced mud around hot springs; walked up a huge, steep cinder cone; and explored sections of giant lava tubes. Bill spotted expanses of glacially polished and scratched stones--stones like those in Italy on which we had seen prehistoric rock carvings. And during our glimpse of the Interior we saw the shiny patina on the rocky expanses that in Death Valley is called "desert varnish." At last, our days were filled with stunning sights to see and ponder. The Great Ice Age that engulfed all of Iceland and parts of Europe in sometimes miles-thick ice was 3 million years ago. But ancient spells of global warming melted all of Iceland's ice, so its current icecaps and glaciers only date to 2,500 years ago (about when the ancient Greek's were in their golden age.) Currently, ice permanently covers 10-15% of the country. And even though the geological delights in Iceland were the densest for us in the Lake Mývatn area up north, seeing the icy side of its story along the eastern coast kept us entertained. A special treat for us was taking a brief amphibious craft ride in a lagoon out amongst the icebergs near a calving glacier. There we learned that glacial ice can be 5 times denser than ordinary ice and that icebergs periodically flip over in the water. Amazingly, this particular glacier comes all the way down into the sea level lake. The massive and gritty, gravely foot of a glacier. We also clambered around on the foot of another glacier and were surprised at how dirty it was. 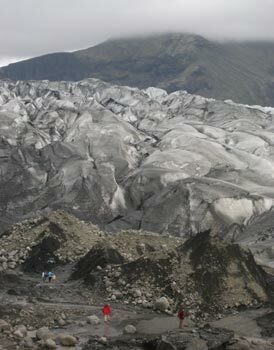 All glaciers become partially loaded with the sand and gravel that they create as they creep along; carving out valleys, but all Icelandic glaciers also get periodic coatings of volcanic ash. Because of that, some of the icebergs in the lagoon were completely black and there were huge piles of black, gritty ash at the foot of the glacier we explored. Miles of the Ring Road in this area was built across black glacial sand plains and occasionally the grit piled up on the road, briefly making imprudent drivers airborne as they traversed it. And here we were surprised to learn that quick sand isn't just in the domain of the tropics but is also a hazard to off-road drivers and trekkers in Iceland. Our minds were whirling as we were forced to reexamine that which we thought we knew, like: is a fjord the water or the land; at what point in its exit from the depths is magma called lava; and just what are the mechanics of quick sand. It was also in the east and south of Iceland where the museums had guides for tour groups that were happy to answer our many questions between groups. Most of them were quite available to let the conversation stray from the museum subject matter to more vague topics like Icelandic social structure, mental health in the remote areas and the effects of tourism on the country. We didn't get all of our questions answered but left those conversations with much deeper understandings of the life and times of Iceland. The 'lily pads' of hillside turf not yet eroded away. "Fire & Ice" is the catchy and apt moniker for Iceland but erosion is less the glamorous but equally powerful force shaping the island. Being over one of the Earth's potent hot spots keeps Iceland growing and in a matter of weeks it sprouted a new island in the 1960's. But though frequent lava flows and eruptions keep adding mass to Iceland, the erosive forces of the weather and the sea are whittling away at its edges at about the same rate. The Icelandic coastlines that take the full brunt of the wind have steep cliffs, whereas the less violently sculpted seafront properties end up with more sloping hillsides, but both lose ground to the sea. No, you don't see bus loads of tourists out to view erosion products like you see for volcanic craters and glaciers, but interesting though less marketable sights exist. The wind and water sculpt distinctive patterns in the thin hillside turf, in the stunning lava fields, on the dramatic sea cliffs and in the ice. Rocks and boulders pushed to the surface. Bill was kept busy translating his German version of an Icelandic geology book (no longer printed in English) to answer some of our questions. One choice tidbit explained an odd erosive phenomena that slowly lifts buried boulders up out of the ground. Apparently many of the house-sized Icelandic boulders that we saw had been slowly pushed up to the surface by the action of repeated freeze and thaw cycles and hadn't recently fallen off of basalt cliffs as they looked. When the water in the ground freezes, the expanding soil slightly lifts up rock of all sizes. As the water in the soil later thaws, fine grit filters into the space created by the ice instead of the boulder sinking back down into the gap, keeping the boulder slightly elevated. With the next freeze, the boulder again gets lifted a tiny bit higher and the lifting process gets repeated with every freeze-thaw cycle, eventually bringing even the biggest boulders to the soil surface. The trendy word "marginal" kept coming to mind while we toured Iceland. It is and has been a marginal place to live for a long, long time and it felt especially marginal to us in western Iceland. Fifty-two percent of country is desert plateaus and 3/4's of the country lacks any permanent vegetation cover. Consequently, most of its people have always lived in the coastal areas where there is relatively more soil and the temperatures are somewhat moderated by the sea currents. Even today, few people live in the island's harsh Interior. 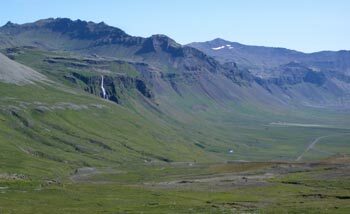 And trees in Iceland are also marginal as it was deforested during the Ice Age and later during its early human history. The oldest tree in Iceland only dates back to 1938. The government has recently started a reforestation program and especially in the east we saw clumps of trees on private land and small forests in newly formed national parks. Interestingly, in Iceland the trees are tightly clustered and almost always surrounded by a fence--in Iceland it is the trees that are penned-in and the sheep roam free. Lacking trees, beached driftwood from Siberia and wrecked sailing ships were the primary source of lumber in Iceland for centuries. We saw house interiors, home furnishings and even fishing boats made from milled driftwood. Only in the mid to late 1800's when trade opened up again was wood imported in any significant quantity. Coming from timber country ourselves, it was hard to imagine living where there just weren't any trees or plentiful wood products. Early in our loop around the country we enjoyed an arrogant snicker with several other tourists as we were all amused by the intense Icelandic pride in their small and stunted forests. One tourist handout mentioned the forest of "exotic trees--mainly pine, spruce and larch." Now, when I think of exotic trees, mahogany and teak come to mind, not these varieties. But when we happened upon one of their little planted forests after 10 days in the country, I had a new appreciation for their zeal. Indeed it was wonderful to be engulfed by something taller than me and to enjoy the naturally filtered sun light. The trees were low growing, sparsely leafed deciduous varieties but they did support a feathery undergrowth of a couple types of wildflowers (including buttercups) and grasses. It was uplifting and refreshing to stroll in this marginal greenery and I better understood why these meager little forests are weekend Mecca's for Icelanders. And it reinforced a hunch that I had had in the Reykjavik cemetery--that it was indeed one of the lushest places in Iceland. There aren't any tall trees in Iceland and there aren't even many tall human-created structures around either. Out in French countryside the nuclear plants were the visible markers for the country's energy source that loomed above the trees; in Spain it was the hilltop windmills that towered above everything else; and in Iceland the tall things we saw on the horizon were the odd plumes of steam coming up out of the ground. Sometimes we'd look out at an open field and see several stories-high plumes of steam wafting up out of some natural vent in the ground. And even in Reykjavik there were pipes dispelling sulfury smelling steam overhead, presumably to prevent dangerous build-ups caused by the ground being sealed over with asphalt. Sheep and horses were by far the most frequently seen animals in Iceland. The stubby legs of the Norse horses makes them all look like ponies until you see the much more delicate colts. Cows and birds were next on the list, and that's about it for animals. We rarely saw any dogs out and about and the only cats we remembered seeing were in the residential areas of Reykjavik. Occasionally a polar bear takes an ice raft trip from Greenland but the sheep herders are quick to kill them. Artic fox are the primary wild mammal on the island but we didn't see a one. Roadside sheep on summer holiday. The sheep in Iceland didn't look like they'd had their brains bred out of them like most of the sheep we see. Instead of being in big flocks of dozens or hundreds, we saw much smaller social groups. Often a pair or trio--mother and youngster or 2--would be nestled or standing together chewing. The pairs or trios might be part of a larger group of a dozen sheep scattered around, usually in an unfenced area. It took a while to get used to seeing sheep standing on the outside of the fences instead of inside them. Rather than running away as a group, each little family unit seemed to make its own decision as to whether to scatter with a passing car. The sheep looked especially contented. Maybe it was because I was bored with the western Iceland scenery, but these sheep looked almost smug as they lounged about chewing. And the more I learned about them, the more I realized that they had a right to feel smug. These guys were all on vacation. Icelandic sheep spend most of the year--from October until almost July--packed like sardines in a barn. In the summer, most of them are released to roam the entire country. They don't even have a shepherd and a dog rounding them up at night or telling them where to go. They spend their summer days and nights doing as they please. In the fall, the Norse horses are used to round them all up for the winter. Finally it dawned on us why they could roam: unlike almost any other place in the world, they have no predators in Iceland. Our idyll hours in the car were enlivened by studying the nuances of the life of Icelandic sheep, but when out of the car we always hoped to learn more about the Icelanders themselves. The young adults were especially competent English speakers and the Icelandic people of all ages were refreshingly friendly and helpful. I quickly learned not to hesitate to ask a fellow customer to translate a package label or an exhibit staff person for an explanation. At one sight we took a chance by asking the clerk a geology question. She apologized by explaining that she was a history major but her dad had written our book on the geology of Iceland and she had clearly been paying attention. She bravely answered our questions and offered up some other information too. At a disappointing historical museum with a mineral display, I asked the staff person why there had been demand for Iceland's sulfur in its early history, as was indicated on a map in our historical atlas of the Vikings. He had a wonderful story to tell that certainly explained why we couldn't guess the answer. In the late 1200's Iceland was controlled by Norway and sulfur was the first product Icelander's were allowed to sell for their own profit. Icelandic sulfur was resold throughout Europe to churches for the clergy to use at the end of their services to illustrate to their flock what hell would be like. We don't know if it was just the smell, or if they created a little fiery episode with the sulfur too. Later on Icelandic sulfur was used to intensify the wars on the continent with gunpowder. But it was positive experiences like with this man at the museum that encouraged us to actively engage the Icelander s as they were very socially available. The overall low level of traffic and high percentage of tourists made driving a very casual affair in Iceland. We quickly learned that often we could drive as slowly as we wanted on a highway if we were rubber-necking and the other cars would just pass without a honk or angry gesture. We could stop the car almost anywhere we chose to snap a photo and the other cars would work it out--or take the cue and stop for the same photo op. It was the most unusually friendly driving environment I've ever seen and we never heard the honk of a horn during our entire stay. 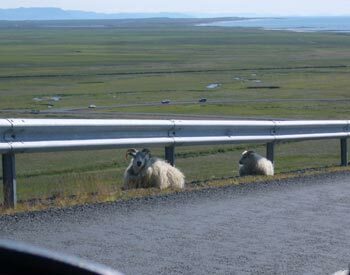 Somehow the Icelanders that travel these roads manage to take all of this self-indulgent driving behavior of tourists in their stride, perhaps allowing for us as they do the sheep on the road. Driving in Iceland is easy--even though we hadn't been behind the wheel of a car for 6 months. Bill pointed out that it must be the only country in Europe where they don't bother with a stop sign (or even a yield) when re-entering the main highway at most crossroads. Its certainly isn't necessary as the traffic is light and there isn't ever much around to obscure the view of oncoming cars. Almost every bridge in Iceland is one lane, which also speaks to the light traffic as do the alarming one lane tunnels. I made Bill stop and back-out of the first tunnel we entered just after we realized it was one lane (of course, in Iceland you can backup because there often isn't any vehicle behind you.) We studied the Icelandic writing and pushed a button at the tunnel entrance hoping it activated some signal to oncoming cars. Our efforts were fruitless and we nervously proceeded into the long, narrow tunnel. Once well into the skinny tunnel, we discovered that one direction of traffic had periodic pullouts and if you were going the opposite direction, you relied on the oncoming traffic using them. Amazing, even with all the clueless tourists like us wandering around, the system did work. Even more alarming than the tunnels was the sighting of 3 different vehicles with flat tires in our first 3 days of driving. Our car rental agent had warned us that our insurance didn't cover tires damaged on gravel roads, of which by necessity we would be driving many. And the later spotting of a tour bus with a 3' diameter shatter in its windshield was another reminder of the driving challenges in Iceland. We estimated that about 15% of the miles we drove were on unpaved roads. Parts of those miles were on the Ring Road or Road #1, the primary road around Iceland. Some of the unpaved roads were smooth and effortless to drive, requiring only a slight drop in speed. On other stretches of the road, we'd be clunking along at 20 miles an hour, hoping for the best. Rarely our speed dropped so low that it didn't register on the speedometer. We drove just under 2,000 miles in our 14 day loop around Iceland and though that was under a 140 miles a day, it was a lot of hours in the car each day. Bill cleaning up at "the baths". A welcome antidote to these rough, unpaved roads was the free, self service car washes at almost every petrol station. They were simple affairs with a long hose with an long-handled scrub brushed attached to the end. There were 2 to 6 washing stations at any gas stop and they were well used. We washed our car almost every day. 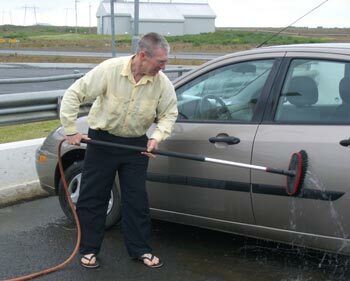 In some areas it was the easiest way to remove the mass of dead bugs plastered on the windshield and front end of the car; and other days we were motivated by reducing the layer of dirt we applied to our pants each time we reached into the trunk of the car. Big commercial trucks as well as min-subcompact rental cars paid their daily visits to the 'baths' for good reason. So, if a trip to Iceland is in your future, don't hesitate to rent a car because of driving concerns. But there will be more about the various ways to get around in Iceland and how the prices of the options compare in "#11 Iceland PS." We are limping along as we make our way north to Edinburgh, Scotland. Part of the limping is due to Bill's knee, and part is due to the lodging challenges. Bill's knee is healing well: the ice, ibuprofen, and time off worked their magic and we are riding again, but slowly. The first few days in the pancake-flat Fens were great for his rehab but the last 2 days of around 1000' elevation gain have taken their toll--we may cover part of tomorrow's route by train. And finding lodging has been a nightmare. We were often riding one day and then laying over the next because all the accommodations a day's ride ahead of us were booked. We are now making reservations 5-12 days in advance to ensure we have a place to stay each night, which doesn't leave us much flexibility to accommodate Bill's knee health. Hopefully the lodging crush will ease in September and Bill's knee concerns will be behind us.